Weather Defender Commercial Edition is a feature rich, leading emergency alert system that is designed to save lives and property by providing advanced warning of impending hazardous weather allowing for critical preparation time. SWIFT Weather is now offering federal, state and local government agencies – including active and retired U.S. military and first responders – 40 percent off as part of a Weather Notification Initiative. The user-friendly and feature-rich emergency alert system provides up-to-the-second weather alerts including always-on threat monitoring and real-time storm notifications. “A first responder seeking a reliable emergency alert system will benefit highly from our Weather Defender Commercial Edition,” said SWIFT Weather CEO Rory Groves. SWIFT Weather today announced that as part of a special Weather Notification Initiative, the company is offering their Weather Defender Commercial Edition software at a 40 percent discount to federal, state and local government agencies - as well as active and retired U.S. military, first responders and related government agencies. The user-friendly and feature-rich emergency alert system provides up-to-the-second weather alerts including always-on threat monitoring and real-time storm notifications. It is the only weather software to combine remote alerting with unique first-person visuals – all in one software application. Weather Defender allows government agencies and first responders to properly prepare by receiving accurate weather forecasts in advance of impending tornadoes, thunderstorms, blizzards, ice storms, lightning, hurricanes, hailstorms, high winds, freezing rain and more. The weather alerting software delivers precise, dynamic weather data enabling the user to minimize risk, maximize preparedness and optimize the allocation of manpower and resources to a designated geographic location with enhanced accuracy. 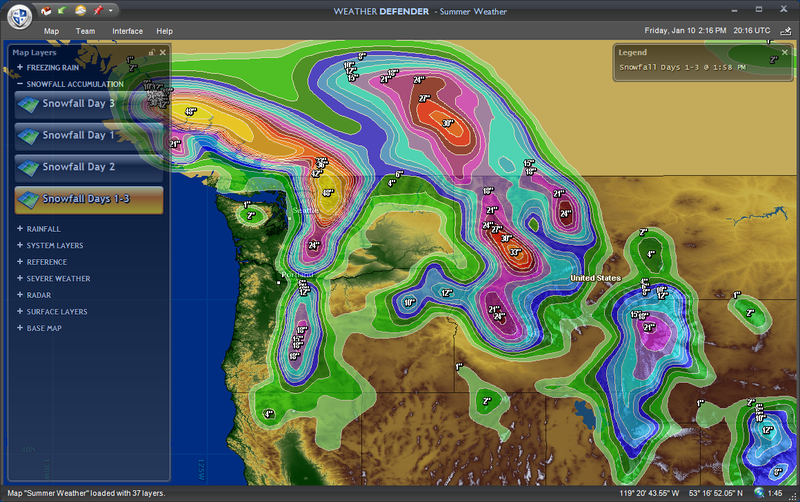 The feature-rich Weather Defender Commercial Edition connects the user 24/7/365 to an extensive network of radar stations and weather satellites, providing critical, real-time weather data. Alert Perimeters can be customized easily and quickly to target specific geographic locations and certain types of weather. Richly defined and highly detailed weather graphics allow for the best preparation or response for impending inclement weather. Additional features include industry-specific weather maps; animated history with time lapse movies of weather activity in the user’s area; GPS integration; GIS import functionality; and premium customer support via email, phone, online documentation and tutorial videos. Visit http://www.swiftweather.com for details and pricing or call 800-960-4586. Map showing snow fall accumulations.Weather Defender allows government agencies and first responders to properly prepare by receiving accurate weather forecasts in advance of impending tornadoes, thunderstorms, blizzards, ice storms, lightning, hurricanes, hailstorms, high winds, and more.